There are many amazing attractions of Baja California, Mexico. Baja California is a land of extraordinary enchantment and fabulous natural beauty. 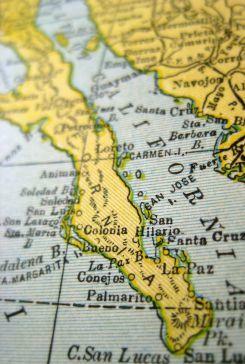 The Baja peninsula is the longest peninsula on the planet. As recently as a few decades ago, Baja was a mysterious and mostly unsettled oasis. Today, tourism has spawned perpetual development in popular vacation destinations such as Los Cabos and Loreto. Rapid growth and new roads have made the peninsula more accessible. The approximately one thousand mile drive across the entire majestic peninsula will show a diverse utopia of jungles, beaches, deserts, and mountains. Today Baja California is the pacific gateway to Mexico. Surfing in Baja is exceptional, attracting surfers from California in waves. Northern Baja makes it possible to enjoy the swells in Mexico and drive home a few hours later. For those willing to travel farther, Todos Santos also offers spectacular waves. Surfing lends itself to camping at night, and since all beaches in Mexico are public, you'll always find a picturesque spot to camp. The benefits of surfing Baja are numerous. Mainly, the quiet seclusion of the beaches is a welcome reprieve from the popular surfing areas near San Diego. The beatific Mexican beaches are immaculate and inspiring. Baja is a true paradise for Mexico beach vacations. The narrow peninsula offers an eclectic variety of beaches, and with more than two thousand miles and two seas, the options are limitless. The palapas and palm trees create the scenic ambiance of some of the regions greatest beaches. Every winter the whales migrate down the Baja for the warmer waters. This is truly a magnificent vision to behold. Between December and March is the time to enjoy some world class whale watching. Whale watching tours can often get you so close that you can reach out and touch these enormous mammals. It's a wonderful attraction of nature to watch the gray whales embark upon this annual 6,000 mile pilgrimage to Mexico. This is the longest journey undertaken by any mammal and a sight to behold. There are many worthy snorkeling and scuba diving spots in Baja. Cabo Pulmo is among the best, with multiple coral reefs. Scuba diving and snorkeling in Baja California opens up a colorful aquatic world of tropical fish and spectacular underwater scenery. The Sea of Cortez offers many uninhabited islands where snorkeling is extraordinary. The physical surroundings of the Baja offer a visceral and timeless beauty. Staying in the major tourist areas do not provide a true glimpse into the many fantastic indigenous plants and animals of Baja California. ATV tours and four wheel excursions allow visitors to travel deep into the heart and soul of the Baja, getting a feel for the nature and the vast expanse of undeveloped majesty. The cacti and flowers of the Baja attract visitors from all around the world. Most prevalent in the tourist hot spots such as Cabo San Lucas and Cancun, water sports are a major attraction in Mexico. Baja offers an endless array of possibilities. Kayaking, parasailing, wave running, sailing and sport fishing are very popular. Cruises to Mexico are becoming more numerous every day. Getting out on the open waters of the Sea of Cortez and the Pacific Ocean is one of the most popular attractions of Baja California. The local cuisine of the Baja is delicious and varies from area to area. Fresh seafood is a major part of most local dishes, and many indigenous recipes have been past down from generations. The Mexican seafood of Baja California is among the best spicy seafood in the world. Restaurants provide a peek into the fascinating culture of the people, all of whom always offer warm Mexican hospitality. Traveling to restaurants situated off the beaten path provides the opportunity to see how the locals eat, and taste the true flavors of the region.